"SUSTAINABILITY" ISN'T JUST A BUZZWORD HERE. IT'S A WAY OF LIFE. We put people, plants, and planet before profit with everything we do: from sourcing organic botanicals, to cleaning up the wetlands and rivers near our campus, to becoming the first zero-waste-certified business in Oregon. It's not always easy being first, but that doesn't stop us from continually looking for ways to do business while leaving the lightest possible footprint on this Earth. Thank you for helping us fund environmental nonprofits, encourage our employees to bike and walk to work, offset our carbon footprint, and preserve the beauty of the nature we were given. Our passion for organics is woven into every fiber of Mountain Rose Herbs’ operations, and we believe this is necessary to realize our mission to put people, plants, and planet over profit. We offer one of the most thorough selections of certified organic herbs, spices, and botanical products and are committed to responsible sourcing. For our customers and the natural environment, we never stock conventionally grown botanicals, and when certified organic materials are not available, we opt for those cultivated without chemicals or synthetic inputs. Many of these are ethically harvested in the wild, thus liberating us from conventional farming dependencies. When we review plant materials, work with our family of farmers, or review harvesting sites, we always take the health of our customers and the environment into serious consideration. The benefits of supporting the organic movement and moving toward an organic lifestyle are immeasurable. Our offerings are also meticulously analyzed in our Quality Control Lab and sometimes sent to third-party labs for additional testing to ensure they are free from synthetic chemicals. Soil requires a symbiotic relationship with everything around, above, and below it, and when this relationship is harmed through chemical means, everything is altered. Organic farming methods often involve more labor, but take far less of a toll on the environment through soil building, crop rotation, careful harvesting, assimilation of the local environment, and composting. Conventional, non-organic agricultural methods require large amounts of synthetic chemicals and fertilizers, which are directly sprayed on the crops or injected into the ground. This practice destroys billions of life forms found in a simple handful of soil, stripping the land of the essential building blocks of life. No matter where you live in this world, you are part of a watershed, and that watershed has a name. Everything you spray, grow, flush, or discard enters your watershed, contributing to the large percentage of rivers, streams, and lakes that are polluted. We believe that direct action is the most effective way to further protect and enhance our watersheds. That's why we created the Mountain Rose River Project in 2009, a grassroots effort that is entirely coordinated and funded by Mountain Rose Herbs. Learn more about it here. When our friends, families, and neighbors choose conventionally grown products over organic goods, our communities and the lives of the farmers who produce the food we rely on are put in peril. Through a process known as bioaccumulation, all plants absorb nutrients and matter through root uptake. Conventional non-organic farms use thousands of pounds of synthetic agricultural fertilizers, pesticides, and herbicides, which are absorbed by the crops they produce. There is no way to wash away the chemicals that have been absorbed through bioaccumulation. Organic farming methods do not rely on intensive chemical applications, but rather on composting, natural fertilizers, and green amendments that contribute to healthy plant uptake, which is good for you and good for the planet! The EPA estimates that US sales of pesticides in 2000-2001 exceeded $11 billion dollars, thus representing over 2 billion pounds of pesticides being dumped on US farm soil, homes, gardens, schools, golf courses and more. This number is about seven pounds for every man, woman, and child in the entire country. There are over 21,000 different pesticides on the US market containing over 875 active compounds. Many of these have been proven to have health implications while the effects of others are still unknown. Lawn pesticides and herbicides can cause cancer, infertility, birth defects, developmental disorders, and will double the risk of canine lymphoma in dogs through exposure. Since 1945, total U.S. crop losses from insect damage have nearly doubled. During the same time, insecticide use has increased tenfold. Today, 71 known carcinogenic pesticides are sprayed on food crops. The EPA estimates that there are approximately 20,000 physician-diagnosed pesticide poisonings each year among agricultural workers. This does not account for those which are unreported. Pound for pound, children absorb a higher concentration of pesticides and herbicides than adults. According to the US General Accounting Office, only 1 percent of all imported fruits and vegetables are tested by the FDA for illegal pesticide residues. The CDC has gone on record as stating, "Pesticides are toxic to life forms by their very design." Thankfully, most herbs and spices are not in danger of industrial genetic modification, so organic certification is our go-to for insuring that our herbal goodies are grown without synthetic pesticides, fertilizers, GMO seed stock, or irradiation. Taking this commitment one step further, we also have products verified through the Non-GMO Project! Many of the products on this list have been chosen for this certification because they are produced from plant crops that are known to be at risk of GMO contamination. What’s the deal with GMOs? Conventional farms not using organic methods may use genetically modified seeds that are engineered to be pest-resistant and easily grown in poor soil. Genetic engineering is an experimental practice, so we don’t yet know the full impact of growing these plants, but the rise of new “superweeds,” more resilient pests, and diseases have been reported. There are other fears that GMO crops can harm non-target species such as insects, birds, bats, and animals that forage from these conventional farms. As fear continues to mount over the long-term health effects of GMOs, more and more consumers fight for their right to know what’s in their food. Without thorough testing, the safety of genetically modified food is unnervingly questionable. The limited safety tests that are currently in place are often conducted by the very companies that use GMO ingredients. This reason alone illustrates the importance of transparency. Did you know that Certified Organic means non-GMO? Look for products that are certified through the USDA’s National Organic Program and certifiers like Oregon Tilth, as well as the Non-GMO Project, to help you avoid GMOs in the products you buy. Or read this resource from the USDA. Learn more about our Non-GMO Project certifications and offerings. Organic Consumers Association: Protecting organic standards for the consumer. Pesticide Action Network: A necessary organization that will help you stay informed concerning pesticide issues. Organic It's Worth It: A resource guide for organic living. NCAP (Northwest Coalition For Alternatives To Pesticides): A nonprofit offering pesticide-free alternatives for the public. Learn more about our organic certifications. Our commitment to exceptional care and cultivation standards applies not only to our products, but also to the hardworking people who grow them. That is why, since 2012, Mountain Rose Herbs has maintained a comprehensive fair trade certification in accordance with the Fair for Life standard. While traditional fair trade certifications primarily focus on the production of finished goods, the Fair for Life program raises the bar by applying fair-for-all principles that ensure human rights and fair working conditions are maintained at each stage in the supply chain. Shaped by its goal of improving the position of marginalized social groups worldwide (particularly in developing countries), Fair for Life’s guidelines support and enrich the livelihoods of thousands of small farmers and workers through fair pricing and an additional, allocated-type of dividend: development premium funds. Fair trade development premiums are placed into a separate a communal fund that workers and farmers can use to improve their social, economic, and environmental conditions. These premium funds can be deployed at the community’s discretion to enhance the local economy (by investing in farm improvements, equipment, or employee housing), or to enrich the community directly (through the construction of schools, healthcare facilities, or vital regional infrastructure, such as roads and bridges). The international certification body, ECOCERT SA, has a strong reputation for its success in promoting regional development through its industry-leading record of verifying compliance with organic, ecological, and social standards. Its fair trade program consists of two certification options: “For Life” and “Fair for Life”. To qualify for the “For Life” social responsibility certification, companies must demonstrate environmental and social responsibility in their own communities and beyond. For Life organizations must provide safe and fair working conditions for their workers, social security coverage and fair pay, reasonable working hours and schedules, and established health and safety practices and provisions. Certified businesses must also substantiate their support of core labor rights, prohibiting practices like child labor and discrimination. In addition, For Life certification reflects a company’s commitment to environmental stewardship through water and energy conservation, ecosystem protection, and responsible waste management. After obtaining For Life status, a company may apply for “Fair for Life” certification, an additional verification process which would qualify the organization to handle fair trade products. A Fair for Life organization must maintain fair and responsible sourcing practices that ultimately benefit primary producer groups, such as farmers. Fair for Life certification encompasses all the social responsibility criteria of the For Life certification while mandating an additional commitment to create and sustain long-term relationships with fair trade product suppliers. By including practices such as fair pricing, open negotiations, and the payment of development premiums, Fair for Life handlers promote and support the principal mission of fair trade certification: to support and strengthen the market position of marginalized producers and workers worldwide, particularly those with no prior access to the fair trade market. As a For Life- and Fair for Life-certified handler, the entirety of Mountain Rose Herbs’ business model and practices are thoroughly reviewed and evaluated annually by ECOCERT. These audits and on-site inspections of our workplace conditions, core labor practices, environmental programs, and local community relations call for surpassing traceability and transparency and affirming our commitment to the standards of For Life-certification. Additionally, in order to maintain our certification as a Fair for Life handler of fair trade products, each link in our supply chain is subject to its own evaluation and assessment. This inter-organizational audit verifies that laborers receive livable wages, that safe work conditions are maintained, and that development premium funds are properly distributed to agricultural communities, many of which had been exploited for generations. We are committed to developing and maintaining long-term relationships with our fair trade growers. In particular, we prefer to source directly from farms, and most of our fair trade offerings are tended by small grower cooperatives. Fair trade development premiums are ultimately intended to benefit these producer groups, and it is especially satisfying to be the “first buyer” and pay these premiums directly to a collective so that its members can improve their social, economic, and environmental conditions. Our commitment to fair sourcing practices and farm partnerships provides us with a variety of opportunities to help small growers, and we are particularly proud of our unique Fair for Life Project in India. Rather than abandon our existing farmers, we decided to invest in fair trade certification for those who couldn’t previously afford it, empowering them to now compete in the global marketplace. Acting as the “mandator” for a farm cooperative in rural India, Mountain Rose Herbs finances the group’s Fair for Life certification audits, pays fair prices for the goods produced, and reinvests the premiums generated by this project to improve the wellbeing of these agricultural communities. Although Mountain Rose Herbs is the mandator of this farm group’s Fair for Life certification, we have no objection to them entering into agreements with other buyers. We do, however, have an “open purchase order” that predicts the amount we will purchase during the upcoming year, ensuring that we can supply our customers with quality herbs from small family farmers we know and trust and that our farmers in India have a predictable income. Year after year, Mountain Rose Herbs is found to far exceed the minimum points required for certification, and we are honored to uphold the standards and principles of the Fair for Life program. We give thanks to the many skilled hands that work hard to provide our food and beneficial herbal ingredients. Learn more about our Fair for Life certification. Mountain Rose Herbs was the first company in Oregon to receive TRUE Zero Waste certification from Green Business Certification Inc. Not only did we make history in our home state, but we also achieved the highest available certification – Platinum! We focus on reduction, reclamation, and recycling. Our first priority is to make sure we only use what we need, and that’s one reason we adopted our zero waste policy back in 2007. At that time, we emptied two dumpsters four to five times a month. After instituting a zero waste policy, we began to empty one dumpster twice a month. From the office to the warehouse to the production floor, we collect and sort every piece of discarded material that would normally end up in the landfill. Every bit of plastic, poly-woven bags, break room food scraps, gloves, hair nets, barrels, and fiber drums are evaluated, recycled, or (more often than not) given a new home. An unwavering commitment to environmental stewardship dictates how we think about our waste management plan. We strive to cut all waste production by rethinking and redesigning our operational procedures to create a more dynamic approach to resource recovery, product design, and recycling. This path helps sustain our bond with the natural world, creates jobs, and saves money. All potential waste is evaluated for recycling, compost, and reuse. All unusable essential oils and carrier oils are collected for biodiesel salvage. All styrofoam is reclaimed, reused, or recycled. All broken and unused electronics are taken to a local facility for proper salvage and recycling. All botanical refuse is collected for composting at local nurseries and our local commercial composter. Learn more about our zero waste certification. Our carrier oils are packaged in 8 oz. and 16 oz. plastic bottles made from 100 percent recycled plastic. Our tins are made from materials containing at least 25 percent recycled metal. Many of our product labels are printed with 100 percent recycled paper stock. Our 4 oz. tea boxes are made from 100 percent post-consumer waste materials. All of our packaging and shipping materials are rigorously screened to ensure we’re using the most environmentally responsible packaging available. We prioritize using lightweight, recycled content materials. Our shipping boxes are made from 100 percent post-consumer corrugation. Instead of plastic bubble wrap, we use 100 percent recyclable, biodegradable, and compostable GreenWrap and inflatable air pillows to fill voids and cushion merchandise during transit. The paper used for inserts, invoices, and brochures is 100 percent post-consumer recycled paper, and the plant-based packing peanuts used to protect glass are never purchased, but are salvaged from incoming shipments. Mountain Rose Herbs leads the industry in environmental stewardship, dedication to organic agriculture, fair trade practices, zero waste innovation, plant conservation efforts, and community support. Through this commitment, we hope to set a standard and encourage other businesses to care for the Earth as the Earth cares for us. 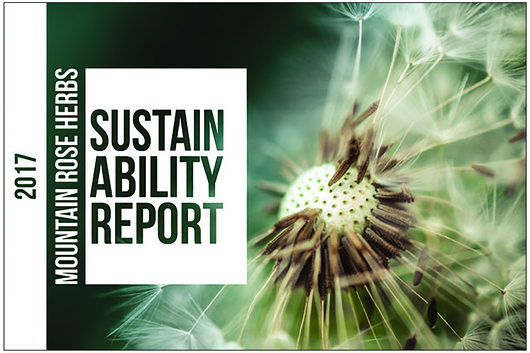 About Our Sustainability Report: Each year we publish a detailed report to measure and monitor our sustainability efforts. From composting and installing solar panels, to organizing riparian restoration projects and supporting nonprofits, we’re accomplishing great things! This important tool helps us analyze our greenhouse gas emissions, water usage, employee programs, charitable giving, and many other key indicators. We continue to improve our sustainability practices as a business, in large part because our customers inspire us and support our mission. Thank you for taking the time to read our report and for guiding us to continuously affect positive change! About Our Benefit Report: Mountain Rose Herbs is proud to be an Oregon Benefit Company, committed to providing a public benefit to people, plants, and planet. Our focus isn’t about making a profit, but it is about cultivating relationships and caring for the planet. Our Benefit Report outlines what it means to be an Oregon Benefit Company, how we measure our impact, and our goals for improvement. Founded in 2009, the Mountain Rose River Project is a grassroots action team coordinated and funded entirely by our company. Each year, employees carry out 10-12 restoration projects through our Paid Time for Community Involvement Program. We partner with numerous state, federal, and nonprofit agencies, primarily focusing on riparian ecosystems, stream health, and fish habitat. See us in action! Planting native trees and shrubs along eroded or compromised riparian corridors. Hand-pulling invasive plant species along our river corridors, targeting English Ivy, Scotch Broom, Japanese Knotweed, and Himalayan Blackberry. Removing litter from natural areas that would otherwise leach chemicals and contaminants into our waterways and groundwater. Incorporating an educational component to our workday, be it a wildflower hike or presentation on local aquatic life, which helps to create a holistic experience for employees. Adopted The Anglers Trail, which spans about four miles along the river between Elijah Bristow State Park and Dexter State Park near Eugene, Oregon. We maintain this stretch by removing invasive species, planting natives, removing garbage, and maintaining the trail. Adopted two segments of the Willamette River through the Oregon program, SOLVE. The segments we adopted include the Upper Middle Fork of the Willamette between Lookout Point and Hills Creek and the section from Elijah Bristow State Park to Dexter State Park. Adopted a two-mile stretch of the Amazon Bike Path in Eugene, Oregon that many employees use when commuting to work. Maintain and continue to enhance our campus bioswale, retention pond, and rain garden, which prevent countless contaminants from entering our river system. Mountain Rose Herbs offers each of its employees three paid days each year to volunteer for Mountain Rose River Projects or any other community, environmental, and social cause in the state of Oregon of the employee's choosing. This amounts to a total of 24 hours of paid time earned annually for each employee. If everyone does a little, it adds up! Mountain Rose Herbs is committed to using the greenest option available in our office, warehouse, and production. All printed materials are 100 percent post-consumer waste material or the highest recycled paper content available. We strive to purchase office supplies made from recycled, tree-free, or chemical-free sources. This includes push pins, scissors, pens, paper clips, folders, binders, clipboards, and other paper and plastic supplies with the highest available post-consumer recycled material on the market. Mountain Rose Herbs does not use standard commercial cleaning agents, nor do we allow any to enter our facility. This list of banned materials includes: toxic chemical cleaning products, bleaches, synthetic and chemical-based soaps, ammonia, chlorine, and commercial pest repellents, fumigants, or other synthetic agents. All of our cleaning products are 100 percent natural, biodegradable, and are approved for use within certified organic facilities. Our primary industrial cleaning agents are ordered in bulk from Biokleen. The production and processing centers within our warehouse use peracetic acid as a sanitizer and industrial cleaning agent. Peracetic acid is a concentrated form of hydrogen peroxide and vinegar, is completely biodegradable, and is approved by the EPA. We fully believe in a nature-based approach and utilize Integrated Pest Management. These practices include the use of sonic repellers and pheromone traps. We do not fumigate or use chemical killing agents. Mountain Rose Herbs’ main campus, located on a 3.5-acre lot, includes a system that naturally collects and filters all surface runoff water. Our landscape is designed to slow water runoff and filter it within our on-site bioswale, retention pond, and rain garden, which are teeming with native plants. This prevents polluted runoff from flowing into our rivers. We maintain our beloved campus with the help of our local landscaper who is accredited by SOUL as an Organic Landscape Provider. Bioswales are often overlooked for their environmental contributions, though installing them is essential for healthy rivers, aquatic communities, and waterfowl. Typically rainwater hits impervious surfaces such as concrete, collects pollutants from our cars, and is discharged into storm drains. Bioswales, retention ponds, and rain gardens remove silt and pollution from surface runoff to help protect our drinking water and aquatic wildlife habitat. We are constantly looking for ways to upgrade our storm water management system and improve habitat and water health for our finned friends. We work closely with the Long Tom Watershed Council to maintain a Trout-Friendly Landscape. In 2013, we also became the first Eugene area business to receive Salmon-Safe certification. We underwent a thorough assessment and evaluation of our water management practices. We conserve water with a satellite controlled irrigation system, maintain a pesticide-free facility, and utilize a bioswale which naturally filters roof and pavement runoff. Our commitment to responsible land care practices and riparian restoration continues to evolve and get stronger with each passing year. Learn more about our Salmon-Safe Certification. Our building was constructed to LEED standards which harnesses an estimated 80 percent of natural light and has decreased our electrical usage for general illumination by over 40 percent! A complete lighting upgrade in our principal facilities to T-8, low impact, fluorescent cylinders, which draw far less power than traditional fluorescent tubes and incandescent bulbs. We upgraded our parking lot lighting to high-efficiency LED fixtures. Our company switched our cargo and delivery vehicles to be powered by used vegetable oil-based biodiesel and a B5 minimum. We installed company-wide LED flat screen monitors, using 65 percent less energy and generating half the heat of traditional CRT monitors. We installed Energy Star-rated heating and cooling units that are maintained and serviced quarterly for optimal performance and efficiency. All computer purchases have been converted to EPEAT-certified (Electronic Product Environment Assessment Tool) models which are Gold Star-rated for their environmental attributes including energy conservation, the amount and type of packaging used to ship and house the computer, and the refusal to use harmful materials in the construction of the computers. All of the appliances, electronics, and other small and medium-sized electrical components that we purchase are Energy Star-rated. We installed waterless urinals and minimum flow toilets in all our facilities to reduce water consumption. Mountain Rose Herbs is proud to have converted to 100 percent renewable energy with our solar array, Greenpower, and Native Energy. In 2015, Mountain Rose Herb installed a 100-photovoltaic solar panel system to generate electricity for our main facility in Eugene, Oregon. The 25-kWh solar array installed on the roof produced 37,917 kWh of power in the first year, saving money and investing in renewable energy. Over the expected 35 year lifespan of the system, it is anticipated to offset 470 tons of carbon dioxide, which is equivalent to the conservation of 10,980 trees or 48,170 gallons of gasoline. And for our employees, we installed a two dock electric vehicle charging station! We continue to innovate and reduce our carbon footprint. Mountain Rose Herbs participates in EWEB (Eugene Water and Electric Board)’s voluntary Greenpower program, which helps to reduce our dependence on fossil fuels and supports local renewable energy projects. Investing in the Greenpower program, which is a project by our local utility provider, EWEB, helps reduce regional air pollution from fossil fuels, and also supports research, education, and projects that advance renewable energy, including EWEB customer incentives for local solar energy installations. Mountain Rose Herbs is currently receiving its energy offsets through Native Energy, a certified B Corp dedicated to investing in community projects that reduce greenhouse gases. Our company's carbon footprint calculation includes electricity use, heating fuels, and company travel which is offset through Native Energy. We are committed to renewable energy sources and supporting carbon sequestration projects that will benefit life on earth. We encourage everyone to work towards reducing their carbon footprint through sensible energy reductions combined with cost-effective carbon offsets. Avoid excessive and unnecessary driving, inefficient vehicles, energy intensive goods with excessive packaging, and inefficient household appliances. While most people can reduce their energy use by improving the efficiency of their homes or buying cars that get better gas mileage reducing consumption to zero through is nearly impossible. Carbon offsets are a cost-effective way to reduce the remainder of one’s carbon footprint. All of the computers and monitors purchased by Mountain Rose Herbs are EPEAT-certified gold, meaning they have been rated and approved for their environmental attributes at the highest level. To reach gold certification, a computer must meet a high standard of environmentally conscious criteria including recyclable/reusable material, minimal use of heavy metals in manufacturing, energy efficiency, and recyclable packaging to name a few. While it may not seem like a substantial amount, Mountain Rose Herbs can go through an average of 10-15 computers annually, which adds up. Our commercial fleet of vehicles includes a cargo van and industrial truck that run on reclaimed vegetable-based biodiesel. The biodiesel we use is manufactured from waste vegetable oil collected from numerous local sources and distributed by a locally-owned biodiesel producer. We have also purchased electric vehicles for local driving and will continue to expand our electric fleet as the need arises. Mountain Rose Herbs offers one of the nation's finest commuting programs, paying substantial cash incentives to all employees who carpool with fellow staff members, ride the bus, bicycle, or walk to work. We pay staff members $0.15 per mile if they carpool or ride the bus and $0.25 per mile for those who bike or walk. Every year, we award the employee who logs the most miles in each category an additional $250. Employees have access to a covered and locked bike depot, indoor lockers, showers, and a bicycle repair kit. Owing to these and other amenities we offer, Mountain Rose Herb was deemed a Bicycle Friendly Business by the League of American Bicyclists in 2013, a label we continue to maintain to this day. As we are all aware, excess automobile usage is an environmental burden with consequences of great magnitude. Driving cars requires unsustainable and non-renewable resources, while simultaneously contributing to increasing greenhouse gas emissions and global climate change. We feel that our Alternative Commute Program works in small part to alleviate these problems, and we hope to inspire other companies to do the same.